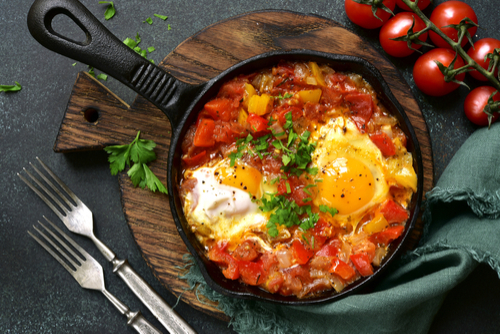 Shashuka is a full-flavored Mediterranean poached egg dish. You make a quick sauce with tomatoes, peppers, onions, and garlic, with lots of olive oil, of course. Then you poach the eggs right in the skillet, just before serving. Marvelous with good bread to mop up that amazing sauce. Heat the olive oil in a deep skillet over medium heat. Stir in the garlic, onion, bell pepper, and jalapeno pepper; cook and stir until the onion has softened and turned translucent, about 5 minutes. Add paprika and cumin and stir for 1-2 minutes or until spices are fragrant. Add the canned tomatoes with their juice; stir, using the back of a spoon to break up the tomatoes. Simmer for about 25 minutes. Crack an egg into a small bowl, then gently slip the egg into the tomato sauce. Repeat with the remaining eggs. Cook eggs until the whites are firm and the yolks have thickened but are not hard, 2 1/2 to 3 minutes. If the sauce seems too dry, add a few tablespoons of water. Bring the skillet to the table and tell the lucky diners to dig in! Note: You can make the tomato sauce ahead of time and refrigerate. The flavor actually improves on standing. Reheat the sauce before adding the eggs.